MELBOURNE, Australia — Australia’s Prime Minister Malcolm Turnbull, Defence Minister Marise Payne and Minister for Defence Industry Christopher Pyne announced Wednesday that Rheinmetall Defence Australia has been selected to supply its Boxer Combat Reconnaissance Vehicle to the Australian Army. The Boxer CRV is a version of the eight-wheel drive Boxer infantry fighting vehicle in service with Germany’s Bundeswehr, fitted with a two-person LANCE turret and Mauser Mk.30-2 30mm cannon. Rheinmetall Defence Australia was competing against BAE Systems Australia, who had teamed with Patria of Finland to offer a vehicle based on Patria’s AMV, but with a BAE Systems Hägglunds CV9035 turret and ATK Bushmaster III 35mm gun and known as the AMV35. 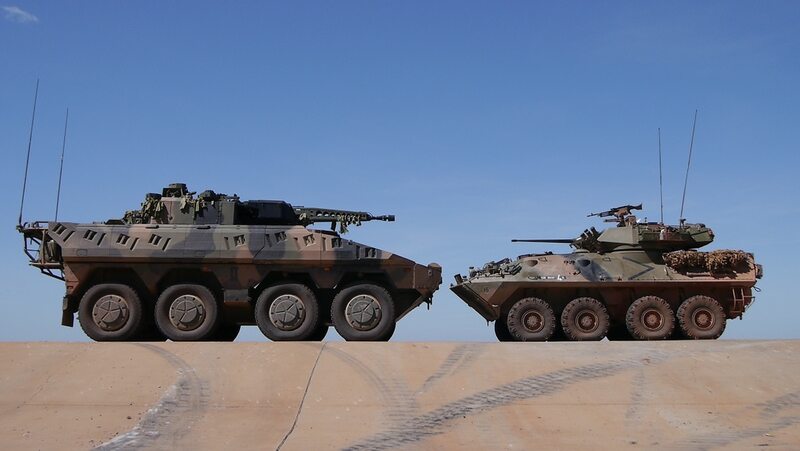 The selection of Boxer comes after a 12-month long risk mitigation activity of the two vehicles undertaken by the Australian Defence Capability Acquisition and Sustainment Group, which included blast survivability testing. Rheinmetall Defence Australia has said that it will establish a Military Vehicle Centre of Excellence (MILVEHCOE) in Ipswich, southeastern Queensland, to complete delivery of the Boxer CRV and to function as an engineering hub for future land vehicle programs. The first 25 vehicles will be completed in Germany and Australian workers will receive training at that time before completion is transferred to the MILVEHCOE in Queensland. The Boxer CRV will be delivered in CRV, ambulance, command & control, joint fires, surveillance, and repair and recovery configurations, with its modular design allowing role changes between vehicles if required. They will replace the existing Australian Light Armored Vehicle fleet and deliver a mounted reconnaissance capability to the Australian Army. A future phase of the Land 400 program (Phase 3) will acquire a tracked infantry fighting vehicle and the two phases together, valued at AU$10 billion, represent the largest military vehicle recapitalization program in Australia’s history.